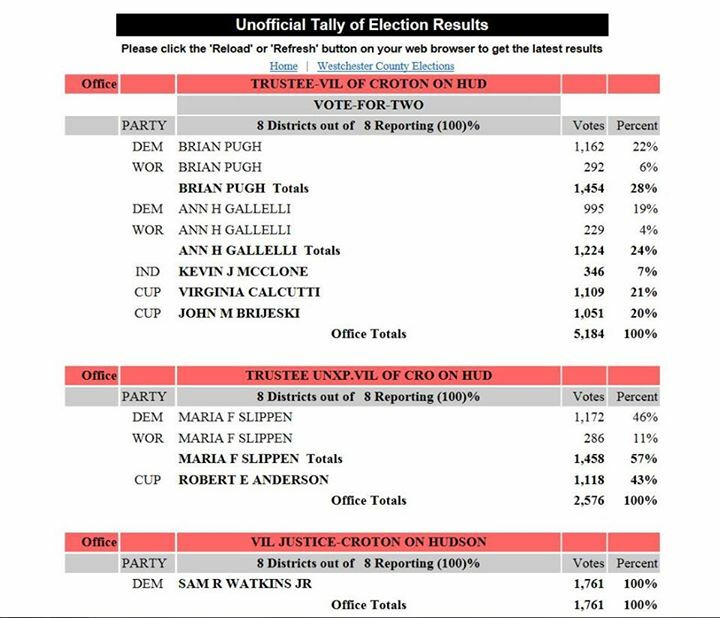 The Board of Elections has just posted tallies of all the ballots cast on election day and Team Croton has swept the election. ← Who Is Selling this Week at the Croton Farmers’ Market? Hooray for this magnificent ad exciting win for Ann, Maria and Brian. We now have the very best Board to be governing Croton in a good long time! They are a terrific group of intelligent, energetic, dedicated, diverse and honest people whose elections bode very well for our hometown. Thanks to them and to all who recognized and voted for this terrific team. They respect our treasured history and strong strong past and have just the right energies and vision for an even better future. We are truly blessed with their willingness to lead us into the future! This election was a referendum on Roseanne Schuyler and Maria Cudequest. Even in the most challenging environment for Democrats in a lifetime, Croton voters rejected the Schuyler\Cudequest brand of ugly, nasty, vendetta-driven politics and voted in a Democratic Party Supermajority on the Village Board. And what an absolute rout it was for the Democrats. Even with Independent Kevin McClone syphoning votes from Ann Gallelli, she still trounced the closest Croton United candidate (Calcutti) by a decisive 10 point margin (55%-45%).